poultry slaughter line,sheep slaughter equipment. 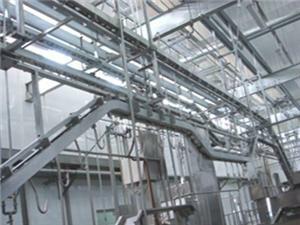 This conveyor is using to delivery and inspection red offals, with the carcass processing conveyor. 1 set of actuating device, 4 set of slewing device. installed power is 1.5kw, stainless steel hooks, space is 2100mm.